Following last week’s misfortune Jenna Ward put in another strong performance as she took her second win at race four, the Thule Surfski Challenge, of the 2019 Marine Surfski Series while Hank McGregor continued his perfect record on Friday evening. Last Friday’s race saw Ward get caught on the shark nets on her way in which cost her the chance to fight it out in the end sprint; but Friday’s race saw it all go to plan for the Euro Steel/Fenn Kayaks star as she got herself in front towards the end and pressed home the advantage for a convincing win. “I wanted to do the pulling on the front because the conditions were pretty flat,” Ward said. It was another great turn out in some very kind conditions at Marine Surf Lifesaving Club with the Durban surfski community coming out in their numbers with the ladies race taking the spotlight as an end sprint decided proceedings for the third race in a row. Former age group Surfski World Champion Ward uses these Friday night hit-outs as a way to gauge her form for the rest of the year. “It is a great training session in racing conditions and it’s a brilliant way for us to see how well we are going. “I am really happy with how I am going at the moment and was happy with how the race went. “With such a competitive series I am looking forward to the rest of the races in the series,” Ward added. Ward was pushed all the way to the end by Michelle Burn who notched up her third second place finish of the series while Kyeta Purchase added a third to her list of achievements this 2019 term. In the men’s race Euro Steel/Fenn Kayaks’ Hank McGregor was unrivalled once again as the ocean racing legend made it three wins from as many appearances on Friday. The North Coast-based powerhouse beat long-time rival Matt Bouman by a minute while Gene Prato finished in third place on the day. Having won the doubles contest last week, Owen Gander teamed up with Mark Usher to get his second win in as many weeks – finishing third overall. Tyron and Trevor Maher were the second double home in sixth place overall while Gary Waud and Glen Hilliar were the third double across the line. In an impressive showing Donna Winter and Danica-Anne Bartho were the first ladies boat across the line. Maritzburg College’s Hamish Mackenzie teamed up with Frances Forsyth to be the first junior boat to the finish while Connor Botha was the first junior single ski to finish. In the short course it was Shaun Burgin and Paige Dennison who were first with Reynard van Antwerpen and Kendra Robinson in second and Lance and Gabi Howarth in third. Ty Haynes was the first singles ski to finish the short course, he finished seventh overall. Friday night saw the Funky Pants Family Feud continue with fathers and mothers teaming up with the children in a series within a series as they battled it out for pride and points in the forgiving surf. 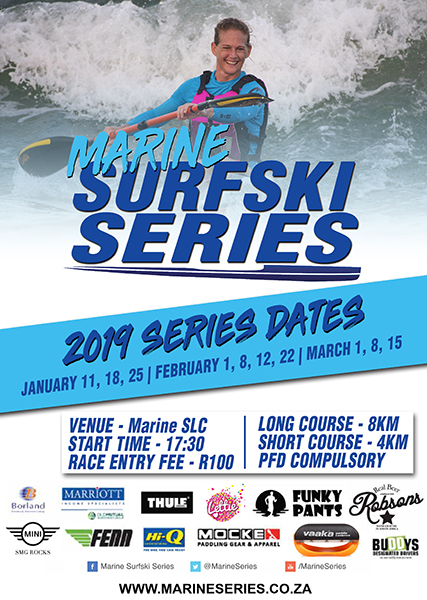 Race five of the 2019 Marine Surfski Series takes place next Friday, 8 February.